Leading OEMs and Tier 1s are innovating to replace traditional physical car keys with digital keys, smartphone apps and wearables. 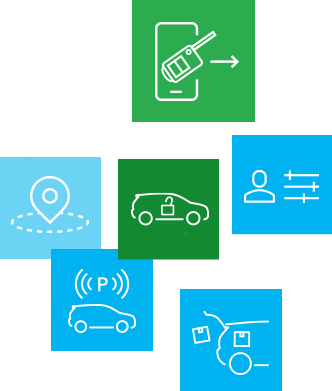 A host of mobile-enabled use cases are set to deliver new levels of mobility and convenience to owners, drivers, rental companies, car sharing platforms and other stakeholders in the vehicle lifecycle. 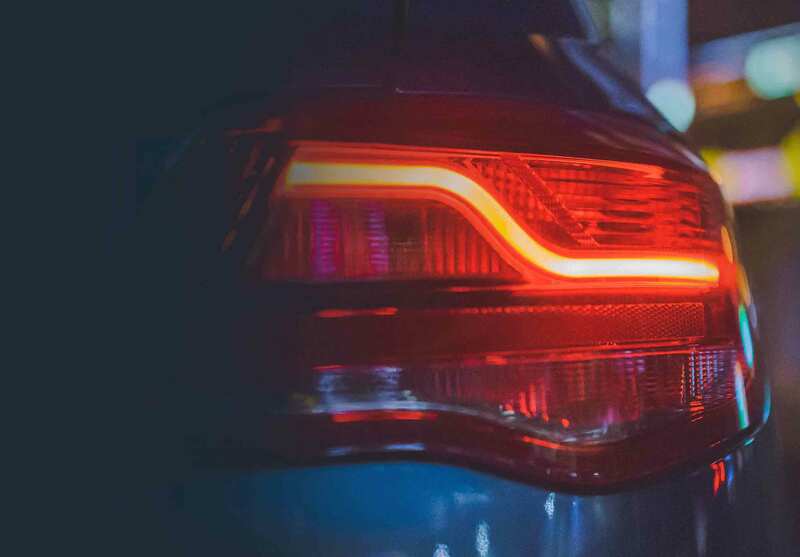 Combined with ubiquitous connectivity and autonomous technologies, this shift towards smart mobile solutions requires a rigorous approach to protection and vehicle cybersecurity. It is Trustonic’s role to provide advanced application protection for the automotive sector. 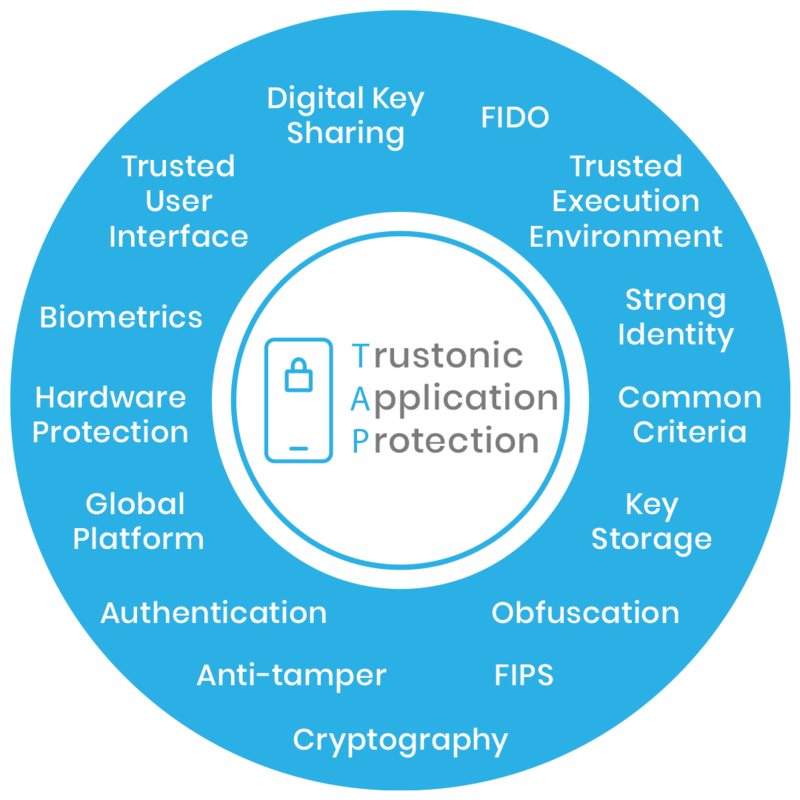 Trustonic’s mobile app protection platform secures smartphone-based automotive apps and digital keys. Digital keys can be securely stored in the smartphone app using Trustonic Application Protection and Trustonic’s Trusted User Interface (TUI) can be used to protect user authentication. Digital car keys deliver convenience and enhanced user experiences, reduce cost and enable new and innovative use-cases including remote key sharing, car club schemes, autonomous parking and geofencing. 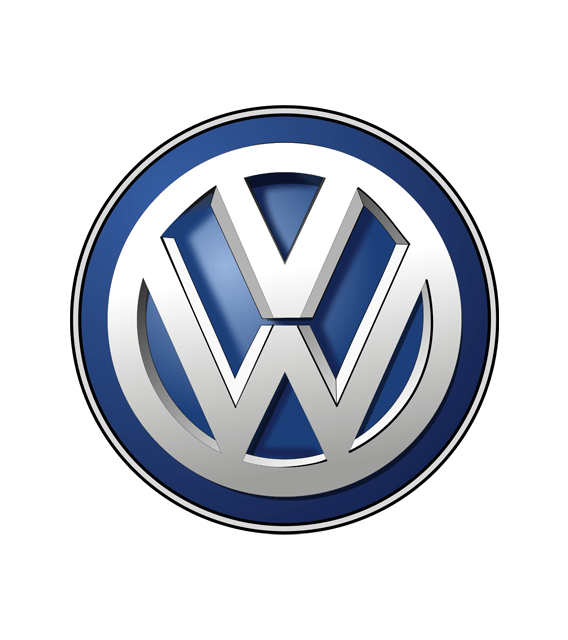 Download the case study to learn how TAP enables Volkswagen to securely share secure digital car keys. 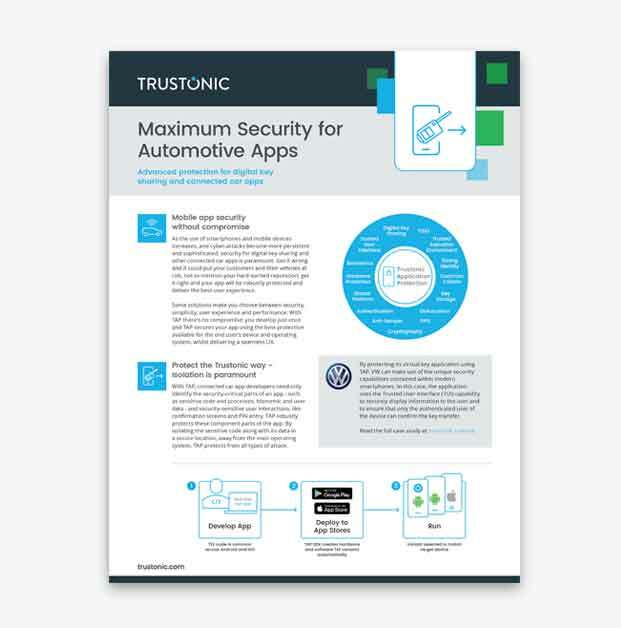 Trustonic Application Protection for Automotive. 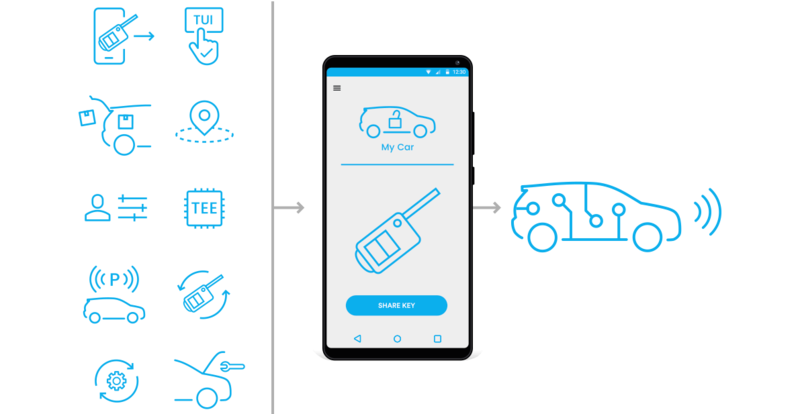 Advanced mobile app protection for digital car key sharing and connected car apps. Hyundai’s Digital Key app is secured by TAP. It allows drivers to lock and unlock their vehicle and start the car engine within a range of about 30 feet of the car, and to give access to four other authorized users via the app. 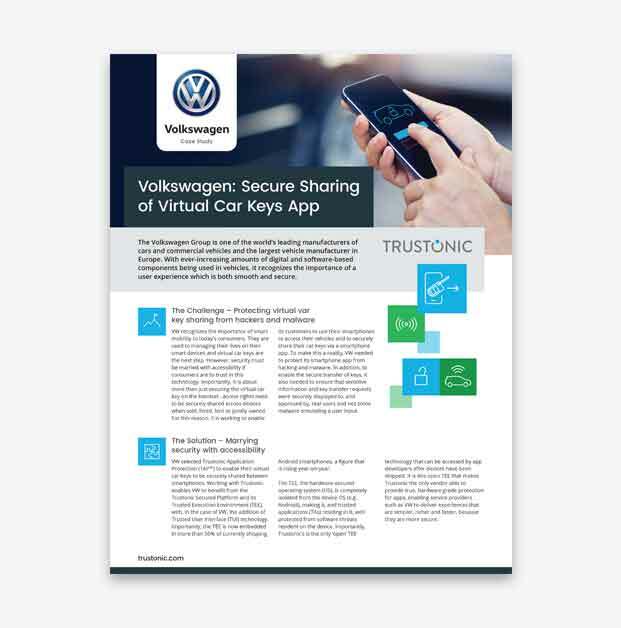 Discover how our mobile application protection brings trust to Volkswagen’s virtual car key sharing app and opens up new possibilities for connected cars and end-users. The Trustonic Secured Platform (TSP) is embedded into infotainment systems. It delivers hardware-backed platform security to enable secure updates of applications, stopping the chance of rogue updates. Its embedded Root of Trust enables services to be assured that their applications are destined for the correct device. Modern vehicles rely on ever more computing systems, both connected and internal. These critical systems manage all areas of the vehicle, including the engine, safety systems, navigation systems and infotainment. In the near future, these systems will also manage driver-less autonomous cars for the mass market and, over time, will even become smarter by communicating with their environment. All these diverse systems require a high degree of trust and reliability. In addition, they must be built on a secure foundation that can stand the test of time, for many years and possibly for decades. The security platforms must be both hardware-backed and upgradeable to enable them to be safe today, but also able to overcome future hacker and malware threats. Trustonic delivers a secure platform, built in at the silicon level, which provides device makers, chipset vendors and application developers with the ability to secure systems and the apps running on them. It can be integrated with any automotive secure operating system, such as Android, Linux or QNX. The Trustonic platform utilises a Trusted Execution Environment (TEE*) built into the processor and delivers this secure capability without the need for additional hardware. The additional platform bill of materials cost to a platform is zero. When the Trustonic Secured Platform is embedded into a device destined to be installed in a vehicle during production, a unique Root of Trust is also created in the device. This is a secure identity, tied to that particular device and can be used both to prove that the device is genuine and to enable the device to prove its identity to other systems. The Trustonic platform enables a secure app ecosystem, ensuring that all apps are from a trusted source, but also guaranteeing that they are isolated from each other. In addition, the TEE architecture also isolates the trusted apps from threats from apps running in the normal operating system. This capability is delivered at the silicon level, thus ensuring that, regardless of whether the app was developed by the OEM itself or by a third party, they are each guaranteed isolation. Trustonic works with leading car manufacturers, Tier 1 head-unit makers and chipset vendors to deliver future-proofed and innovative services. The TEE is a secure area of the main processor in a smart phone (or any connected device) which ensures that sensitive data is stored, processed and protected in an isolated, trusted environment without an extra Bill of Material (BOM) cost. The TEE’s ability to offer isolated safe execution of authorised security software, known as ‘trusted applications’, provides end-to-end security. It achieves this by enforcing protection, confidentiality, integrity and data access rights by providing the means for strong user and device authentication. In particular, the TEE offers a level of protection against software attacks running in the Rich OS environment. It houses business-specific sensitive applications which need to be isolated from the Rich OS. The Connected Car – shiny, exciting, but is it secure? At Trustonic, we are obviously excited by the possibilities offered by connected cars, but we also see the security issues and are keen that security is at the forefront of minds, rather than being a late afterthought.